Milk…..What’s in it for you? June is National Dairy Month. National Dairy month was first celebrated in 1937 to encourage Americans to drink more milk. Milk and dairy products comprise a diverse group of foods from fluid milks, fermented milk products, and over 500 cheeses. Milk has long been associated with good health, making it one of the heathiest beverages consumed in the United States. Current Dietary Guidelines recommend daily consumption of dairy for greatest impact. The body requires essential nutrients to maintain optimal health. Milk and dairy products are rich in many of these nutrients. Milk and dairy products contain calcium, vitamins A, D, B12, and high quality protein. The body absorbs calcium with the aid of vitamin D, both of which are found in fluid dairy products. Milk, whole, low fat, and skim, are homogenized and vitamin D fortified. The amount of consumption from the dairy food group depends on age. Generally one cup of milk, yogurt, or one and a half ounces of cheese is considered a serving from the dairy group. The cost of milk and dairy products varies. Careful selection can result in substantial savings. 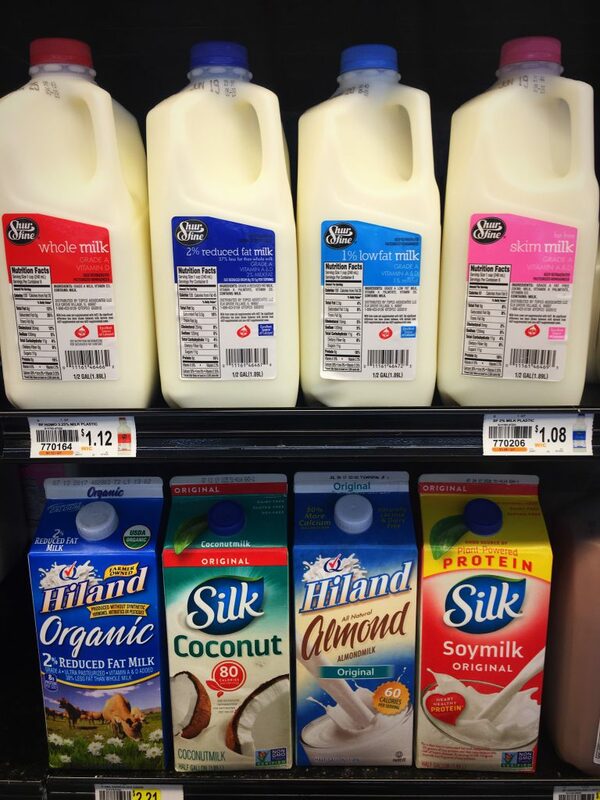 Milk generally is less expensive as a source of calcium than other dairy products. Effective shopping skills depend on understanding and using information on the label including nutrition facts, product date, contents and ingredient statements. Usually larger containers, such as half gallon to a gallon cost less than single quarts. Compare the cost of the number of servings. Milk and dairy products are highly perishable, so careful handling and storage to prevent spoilage, preserve flavor and retain nutritional uniformity is needed. Florida regulations call for uniform standards for dating milk and requires all dairy processors to label milk and dairy product containers with the last date the product can be offered for sale. The date on the container does not mean that the milk will be spoiled on that date; it indicates that the milk should not be sold beyond that date. This is to insure a reasonable shelf life in your refrigerator after it is purchased. The quality and flavor are still dependent upon careful handling and storage. Remember, milk and dairy products are highly perishable and should be kept cold. In recent years many kinds of alterative milk products have appeared in the market place. In choosing a dairy milk or dairy alternative you should be aware of the different alternative milk products available and what makes them different. With so many kinds of milk and milk alternatives on the market, reading the labels on containers to recognize differences in the contents is well worth while. Here is information on some of the more popular forms of milk alternatives now available and an explanation of some special terms you may find on labels and facts that may help in buying. Low in protein or calcium content. Nutty flavor. Grassy flavor. Tends to separate when added to hot beverages. Low in fat and protein content. Higher in carbohydrates. Higher in protein content. Thick texture often taste. There are many ways to add milk into meals. Many people find milk refreshing and never tire of drinking it plain. However, cooked foods and other prepared foods offer many additional ways to add more milk into daily food, always with much added nutritive value and often extra dividends in flavor. Use milk instead of water when preparing cooking cereal, or add milk when preparing soups, mashed potatoes, custards sauces and other cooked foods. Beverages made with milk or milk products fit into meals and snacks and add extra nutritive values to daily fluid intake. June is National Dairy Month, but milk is needed for good health every day of the year.